Here at Kawamoto Orchid Nursery we usually well carry between 200-300 budded and blooming Phalaenopsis orchids in our showroom. Please stop to browse our beautiful Orchid showroom. met, with or without a greenhouse. Many people say it grows just like a house plant. Large mature plants can bloom for three months at a time and, in some cases, bloom twice a year. An American Orchid Society demographic survey showed that Phalaenopsis have become America's favorite orchid. Water- How often you water will depend on the potting medium. Bark retains less water than moss. If your phal is potted in bark watering once a week (drench the plant well) is generally sufficient. If your plant is potted in sphagnum moss, water when the top feels dry to the touch. The amount of light and heat your plant receives will also affect how soon your phal needs watering. Summer months will need more frequent watering, and winter months will need less. After a watering a few times, you will be able to tell by the weight of the pot whether or not it is time to water again. If you are in in doubt, just wait a day. Light- Phalaenopsis are ‘low’ light type of orchids and are great house plants. These plants grow beautifully in an east facing window and can be grown in a south or west window if protected by a sheer curtain (Never put in afternoon direct sun). A phal’s leaves should be olive green. If they are darker it means the plant is not getting enough light; red tinged leaves mean the plant is getting too much light. 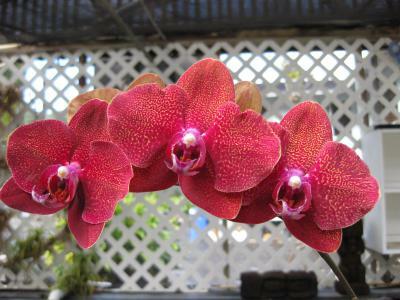 Temperature and Humidity- Although phalaenopsis will grow at temperatures between 60 F and 90 F, the optimum maximum is 68 F at night and 85 F during the day. However, plants perform reasonably well at temperatures of 64 F during the night and at warmer day temperatures. Relative humidity should be 70 percent during the day and 50 percent at night. When night temperatures drop, the relative humidity increases. The easiest way to provide adequate humidity in a home is to fill a plastic or glass tray with gravel or small rocks, and maintain a layer of water in the bottom of the tray. Place the container on the gravel or stones; make sure the bottom of the pot does not touch the liquid. Water evaporating from the tray will bathe the orchid in humidity. 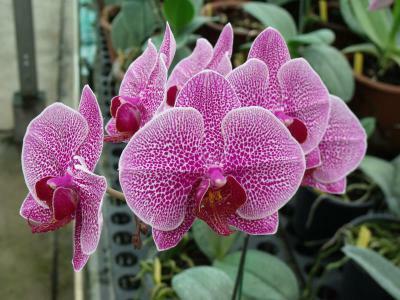 Choose a tray approximately the diameter of the orchid’s leaf span to concentrate humidity around the plant. Fertilizer- Any balanced orchid fertilizer (look at the numbers on the container, 20-20-20 or 15-15-15, etc.) can be used to fertilize your orchid. Feeding weakly (half strength) weekly works well. Once a month, use clear water to flush any accumulated salts from the potting mix. Where to cut the flower spike after it is done blooming- When the blooms are finished, you can cut the spike down to the level of the leaves. Then the plant will hopefully bloom with larger flowers on a new stem/spike that will form next year. You can also cut off the stem leaving two nodes (those little brown lines on the stem below where the flowers were) on the stem. One of these nodes will then initiate (50% chance) and generally produce flowers within eight to 12 weeks.